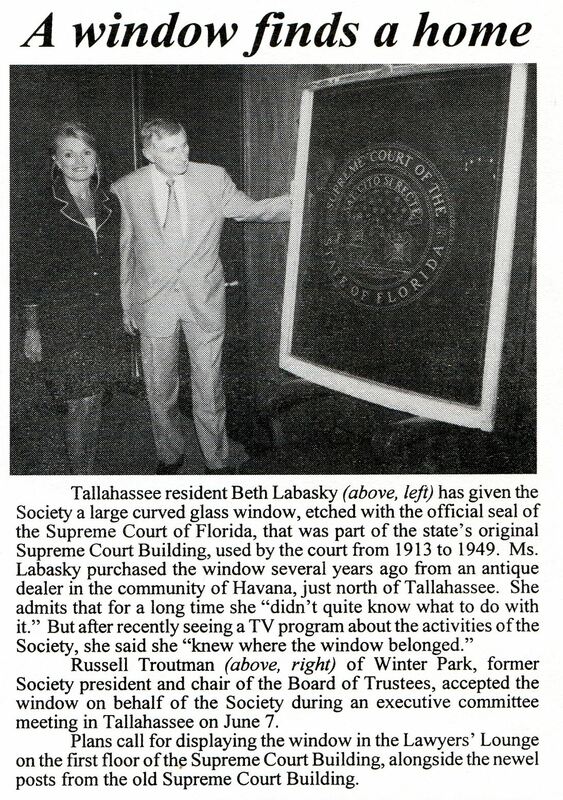 An historic curved glass window with the seal of the Supreme Court of Florida etched into it is now on long-term display in the Lawyers’ Lounge in the Supreme Court Building. The window came out of the first Supreme Court Building, constructed in 1913. Now demolished, it stood on Monroe Street a block south of the old Capitol Building. 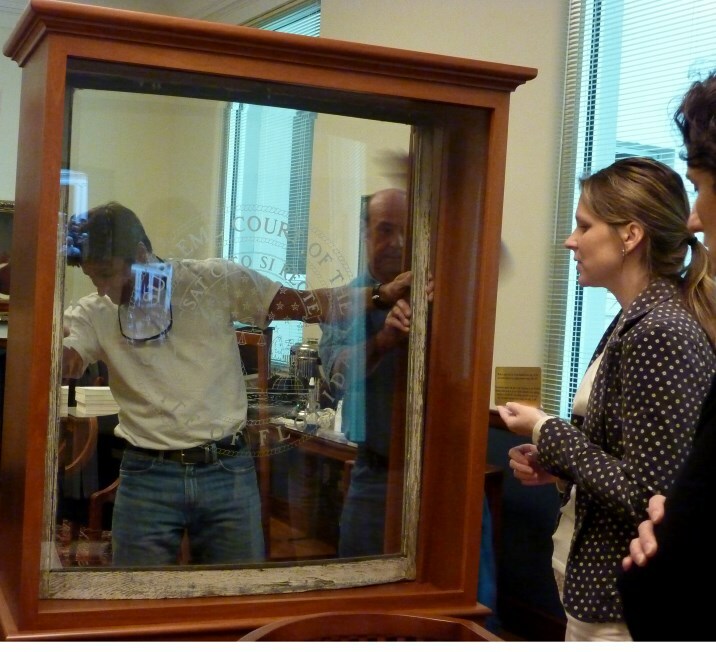 Thanks to a generous donation by the Supreme Court Historical Society, the window has been installed in a beautiful custom-built mahogany display case designed by Charity Myers of The Creative Pool exhibit design firm. Also on display in the Lawyers’ Lounge are two cast iron staircase newel posts that were also part of Florida’s first Supreme Court Building. Florida’s Supreme Court Building is home to a number of historic treasures, cared for by court’s library and archive, that date back to the 1820s. Please stop by to have a look at this treasure of our court’s long and fascinating history. Window, etched with the seal of the Florida Supreme Court. Curved and beveled glass set in a window frame. Circa 1912. This decorative window was part of the furnishings of the first Florida Supreme Court Building, completed in October 1912. 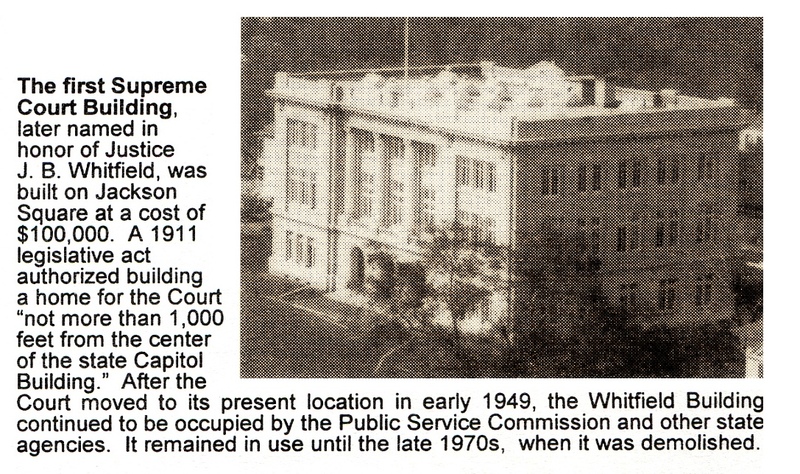 The building was used by the justices until the present Supreme Court was occupied in 1949.